This was a fantastic read. Heather O'Neill is quoted on the back of this book saying: "...an addictive and wildly fun read." I must disagree with the thought of this being fun. It was very enjoyable, but equally heartbreaking. I found very little fun about this save for the format of the story. 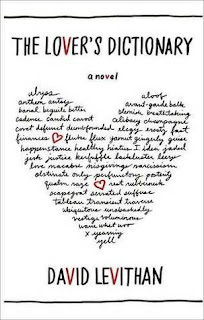 If you have ever been in a relationship you should read this novel. It was so well-written(as one has come to expect from David Levithan). I love how the narrator is a man, but the lover is not ever identified as male of female. I think it helps you to see the relationship in two different worlds, or in whichever you can comprehend. I also loved the repetition that slowly revealed parts of the story further. This was a completely fantastic novel and a very fast read. You should buy it, because you will want to pick it up again and again. 'I don't normally do this kind of thing,' you said." "But in a perverse way, I was relieved that you were the one who made the mistake." David Levithan is amazing. Great review--I can't wait to read this one! I'd never heard of this book before, but it looks really good. Thanks for the review. I am so happy to read your review...I just decided last night that I am going to give this book away later this month--All without having read it. But, I've read enough Levithan that this book is going to be brilliant. Thanks for affirming what I thought to be true! I have this one waiting for me to read. I've heard great things thus far and I go into any David Levithan book pretty much expecting to love it. I loved this one too. It was just so fresh and totally honest. It was heartbreaking but completely romantic all at once. It was so real - perfectly captured all the emotions of a relationship and the relationships that come with a relationship. I was under the impression that the lover was a woman though - I think in the first few pages he alludes to her being pregnant.... he aks "who's the father?" I believe. But you're right - the lack of description of the lover just really made it all that more vibrant. The relationship was on display, not the person - which is why it's such a great book.